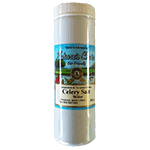 Celery salt is especially delicious over salads and in stews and soups. It makes a perfect combination with avocado. Add a few grains of rice to the shaker to prevent caking. Replace the rice regularly.